What have I been up to the last few weeks? My sewing machine was in for a clean and a service while I was away to Beautiful British Columbia to have a little holiday and spend some time at Quilt Canada BC in Penticton. Fruit trees were blooming in Cranbrook! 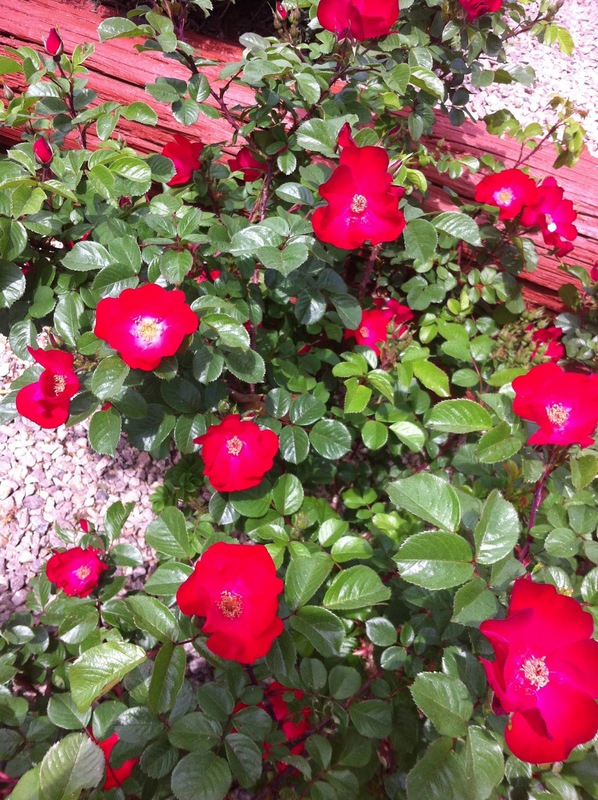 Roses were blooming in Penticton! The scenery was awesome! It was great to see the green leaves and the fruit blossoms! In Calgary, the leaves were not quite out yet when we left. The wines we tasted along the way were delicious! 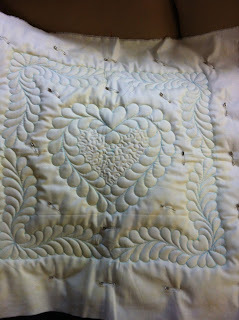 And the quilts were inspiring! I'll be sharing some of those over the next week or so. 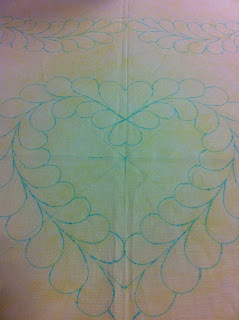 We used stencils to mark our patterns onto our fabrics. I brought a dark red tone on tone and the blue marker didn't show, so I ended up using a piece of pale yellow fabric for my top. Then it was time for the trapunto layer. We could use a poly batt and stitch around the outline of the design elements with water soluable thread, cut away the excess, quilt and then dissolve the thread to get that classic puffy look you see in Elizabeth's quilt. 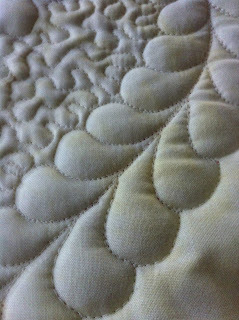 OR we could use a layer of wool batt directly under the quilt top (along with a thin cotton batting under that), quilt the design and the wool would flatten in the heavily quilted areas and puff in the feathered area. I chose to use the wool batting. 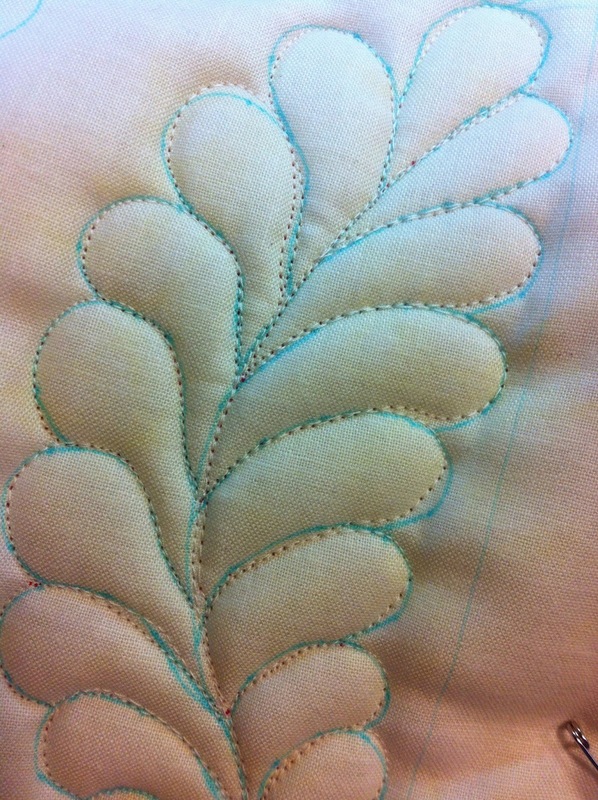 After some practice on a sample piece, I went to work on the real project piece! Following the lines was a bit tricky at first, but was easier as I kept at it! I was happy to have completed most of my quilt top during class. Just a little stippling to do in the between spaces and I'll be done! A little water takes away the blue marker! And the feathers look pretty decent once the blue marker was erased with a little water. Look for a few feathers and other designs on upcoming quilts - it takes a bit longer than the free-hand meandering patterns I do right now, but I think it will add a whole new dimension to my quilts! Great feathers, Ann! It was so good to meet up with you in Penticton! Your feathers are amazing! Looks like a class I would enjoy. Great job on the feathers! Nice feathers, how wonderful that you could make such a nice and instructive trip!